Bedrest Boutique: DAY 18: "Letting Go Therapy"
resigning myself to being at the mercy of others. I took this picture of Holland because I cracked up when she and Jonathan walked in this morning. What in the world did my husband let her walk out of the house in? 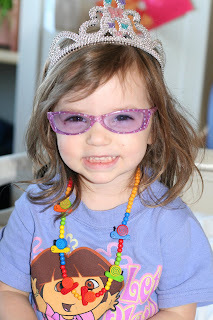 A tierra, purple lensed glasses, a fun snail necklace, a Dora t-shirt, and jeans with embroidered white flowers on them. Now don't get me wrong, I love all of these items - it's just the combination of them together that I have issues with. Those of you who know me, know that I like to dress Holland a certain way! This just happens to be quite different from "my way". However, since I am learning to let go - I had no choice but to look at the smile on her face and realize that she found great joy in putting together that ensemble! For now, I will try and surrender my need to control how she dresses and let her have a little fun with it! I can't promise I will continue with this attitude once I am up and about, but who knows crazier things have happened! i would be a terrible influence too because i LOVE her outfit. i would pretty much wear that myself. mrangelmeg came to the hospital once with the kids in pyjama pants and house slippers because he swears that I hid their shoes before I had the audacity to be hospitalized. That was many many years ago and when I realized that he was doing the best that he could under extremely trying circumstances for his male brain. Though one of those children to this day is much more comfortable in yoga pants and slippers than real clothing at 20 than most girls her age. He started her down that path. God uses what is available as lessons for us in surrender, be thankful that this one at least brought you a smile.